One of my best memories from my time at YMCA Camp Abnaki was late night Dungeons and Dragons sessions with me and a couple of other friends. Collectively, we were known as the Geek Squad (this was prior to the Best Buy computer repair group), because together, we were interested in all things science fiction, fantasy and Monty Python. During the camp season, we would gather from ten and go until midnight, when we were given a couple of hours reprieve from the campers, and escape into a fantastical world that one of our number, Sam (who was inevitably the dungeon master), had come up with. From 2002 until 2006, when we were all together, we would play this fairly regularly, with other staff members coming and going, but always with the core group of the three of us. Sadly, in 2007, we didn't return to camp, and since then, the Camp has been without the Geek Squad, for better or worse. In the ensuing years since that time, we've gotten together when we can; Sam lives in Massachusetts, I live in Vermont and until recently, Blackwell lived in New York City, making regular gaming sessions difficult. Oftentimes, when we met up, we didn't have the time to play. Then, in June of last year, Sam got married, with Blackwell and I on his wedding party, and with another close friend in attendance. The night before the wedding, we sat down, ordered pizza and cracked open the books and resumed the same game that we had left off a couple years ago, jumping in with little difficulty. That opened the floodgates for us, and in the time since last June, we've gotten together to play our game, and start several of our own. In the past two months, I've made the trip up to Burlington to gather with several of my friends, where we continue with whatever story we worked on last week. 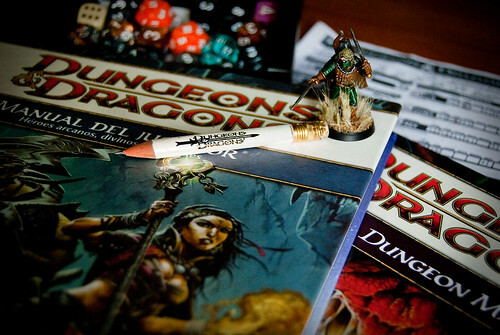 I see the actual game of Dungeons and Dragons as something exciting, something that augments storytelling and makes me think creatively - and I'm just the player. This past week, I've begun a game with a larger group of friends, with an incredibly fun world that Blackwell has put together, a game that has made me think about how worlds work a bit more. Upon my return home last night at midnight, I promptly cracked open my red notebook with several story ideas that clicked over the course of the night. In most of their cases, I'll likely do nothing with them, but a couple others are things that I want to expand, and make my own stories in my own worlds. As I've begun to write more and more, the importance of the numerous story elements such as setting and story have been impressed upon me. While I have yet to write any sort of serious fiction, the thought has crossed my mind, and my notebook is slowly filling up with story ideas as I come across interesting ideas and situations that I think would be interesting out of context. However, playing some of these games with friends have been more helpful, as I'm literally forced into the mind of whatever character I'm inhabiting. Purposefully, I've worked to create characters out of my element, people who are very different from me, and I'm appreciating the challenge of helping to contribute to the story as needed. Beyond the practical elements that D&D provides for me on a potentially professional or cogitative level, there's another oft-overlooked element that I feel requires attention. D&D brings people together. No, let me rephrase that. D&D brings geeks together. As a population group, we're an intelligent, dysfunctional and at times, anti-social group of people, and in particular, I've found that I like getting together with friends. Our encounters tend to be hilarious, fun and overall, a good way to spend an evening once a week. While at camp, Sam and I taught a class called Fantasy Gaming, where we helped to reinforce a lot of the same elements that I've found positive about the game. We taught things such as team building, social interaction for kids who might not otherwise be comfortable in a sports class, and a way to get their creative juices flowing with story ideas. Our class was immensely popular amongst campers, and staff members alike. I don't understand the bad rap that D&D gets, although I can see where a number of short-minded individuals would get the idea that it's a tool of evil, simply for incorporating fantastic elements. The game is much more than that. No, I see the game as a way to build worlds, characters, and stories. I'm already looking forward to my game later this week.